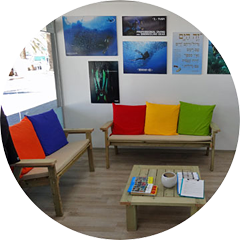 We've built our reputation as the premier dive operation in Eilat on three basic ideas: giving you value for your money, making sure you get personal attention throughout the time you spend with us, and taking dive instruction seriously. 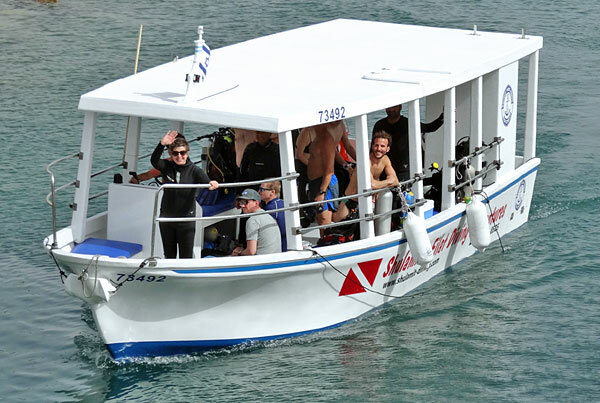 Nearly a decade after we began by giving courses and offering shore diving out of the basement of Shulamit's house, the dive center proudly opened its new facility in one of the more scenic locations in Eilat, along the Crowne Plaza Hotel section of the Promenade at the Eilat Marina. 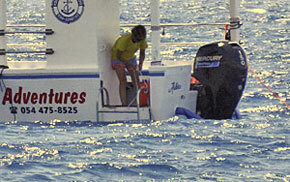 Our custom-built dive boat Ashira is docked barely a hundred meters from the center's front door. 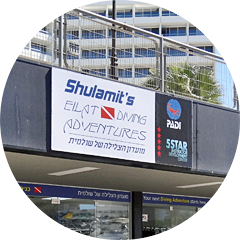 Shulamit's Eilat Diving Adventures is a PADI 5-Star Instructor Development Center, and is licensed by the Israeli Sports Diving Authority. 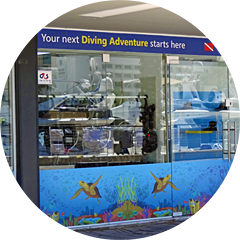 The dive center sits in 140 sqm (1500 sq ft) of storefront space along the pedestrian promenade ringing Eilat's marina. 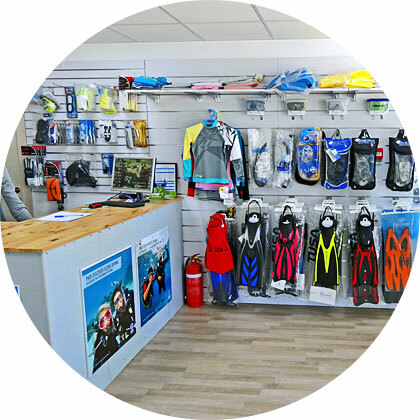 The “dry” reception area includes a sitting area and coffee corner, a counter for doing paperwork, and a retail area where we feature diving and snorkeling equipment from major manufacturers such as Beuchat, TUSA, Body Glove, and the Israeli importer SEPA. Just beyond the reception area are our two classrooms. The rest of the dive center, with its own separate entrance a few meters away, is the “wet” area, which includes benches for getting organized before and after diving, rinsing bins and hanging facilities for diving equipment and wetsuits, key lockers for storing your personal stuff, an equipment storage area, the compressor room which is also our tank storage area, a bathroom with two private stalls, and a shower room with private hot & cold freshwater showers. Ashira was built for us in 2016-7 in Akko, northern Israel, by a family-owned business that has been building boats for five generations. She is 9.3m (31 ft) long and 3.2m (10.5 ft) wide, has a fiberglass hull, and is powered by a brand-new (as of May 2017) Mercury 150hp commercial outboard engine. Ashira is licensed by the Israeli Transport Ministry and carries a full complement of marine safety equipment, and of course oxygen. Ashira goes out every day for dives at some of the very best reef sites in Eilat. In the Hebrew Bible, Ashira is the first word in the Song of the Sea sung by the Israelites after safely crossing the Red Sea. REGULATORS: Mares MR-12 sets and Beuchat VRT90 sets, all Nitrox-clean. BCDs: Weight-integrated BCDs only, all with trim weight pockets: Mares Prestige Elite MRS+ and TUSA Soverin. COMPUTERS: Suunto and TUSA, all installed in regulator consoles. Adjustable for Nitrox %. WETSUITS: 5mm, 3mm long and 3mm short, depending on season and personal preference. Also some "women's wetsuits". Also hooded vests and hoods. If you have a personal wetsuit, by all means bring it, but please don't bring a heavy wetsuit in summer. FINS: Strap fins. Your choice of split-fin or “regular”. Full-foot fins are not really suitable for shore entries. GLOVES: Forbidden in the Coral Beach Nature Reserve, which covers most of our dive sites. 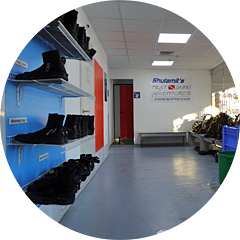 We have a few pairs for Wreck Diver Specialty Courses. Knives are also forbidden, by the way. TANKS: 12- and 10-liter aluminum tanks (aluminum 80 and 60), all with DIN valves and removable yoke inserts. 6-liter pony bottles for Deep and Wreck specialty courses. All filled from our Bauer Mini-Verticus III compressor.